“[350-mile range] will represent the lower ‘bookend’ of our showroom range and, for now, it should give us as much access to the volume end of the EV market as we need.” — Polestar COO Jonathan Goodman. Speaking to Autocar at the Goodwood Festival of Speed (great name!) last week, Polestar Chief Operating Officer and Volvo veteran Jonathan Goodman revealed some details about Polestar’s sophomore effort, the Polestar 2. Volvo 40.2 concept car, a 2016 design that hasn’t gone into production. 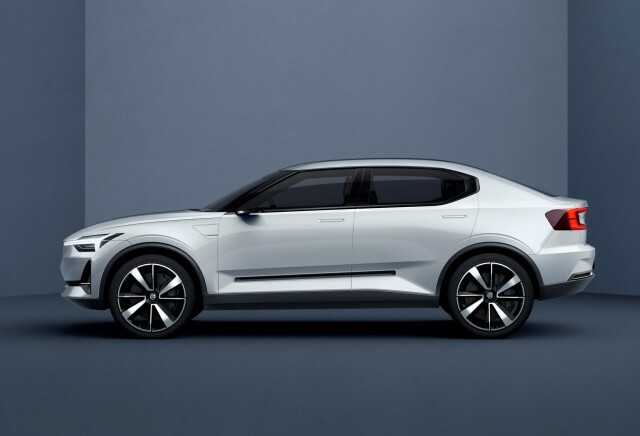 The Polestar 2 is expected to land with an overall similar design. We at MVS believe the off-road hints (shouts?) of this concept will not survive to the actual Polestar product. Notably, Polestar is rolling out its line slightly differently than Tesla. Also of note is Goodman’s and presumably Polestar’s design ethic, which is best summarized by saying they’re not going far out on a design limb. The global electric car market was worth four million units in 2017,” explained Goodman, “but it’s quite widely expected to be worth 29m units by 2025. EV owners will come from all walks of life. So it’s a mistake to assume that, because the cars are electric, you have to make them quirky or futuristic. If we’re looking at a market worth 30 million cars within seven years, it isn’t going to be niche, it’s going to be mainstream. So you just design a great-looking car—not one with a big blue flash down the side. Also interesting to us at MVS is that Polestar chose the CMA platform rather than the larger SPA platform. That decision begs the question: will Polestar’s fourth offering be an executive EV sedan? We’ll continue to follow and report the latest Polestar news.